How simply adorable are these handmade cards?! Tired of the typical Hallmark cards that all look the same? Go for something simple yet beautifully created to show someone how much you care. Each month Handmade Happy sends you 5 cards. You’ll get a holiday card, 2 birthday cards and 2 general sentiment cards. Perfect to take care of each months needs of birthdays and events for all you busy bee’s! They have some lovely birthday, thinking of you, missing you, love you cards, cards for all types of occasions to remind the receiver of the little things, and a handmade card is always better then those typical store bought ones that they’ll just throw out. 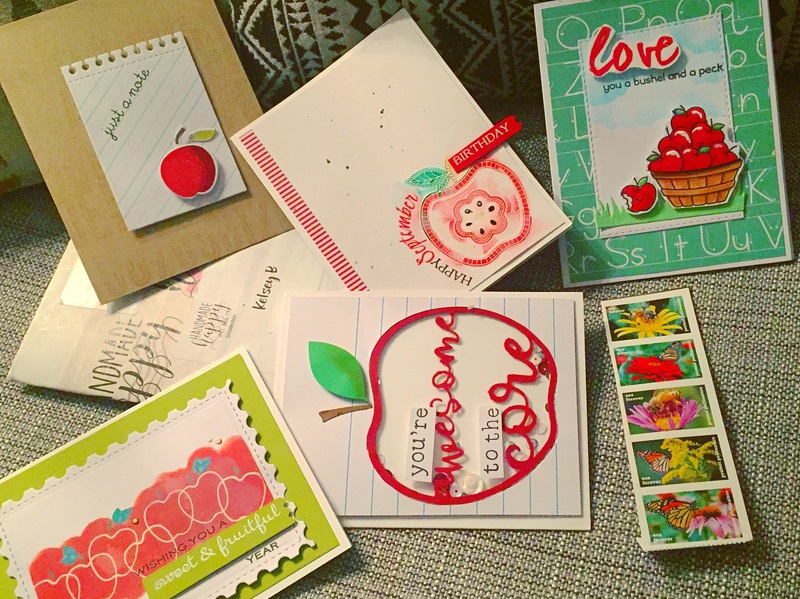 In this box we have 5 adorably created cards that are all perfect for Fall, September and the back to school season with that red apple theme. They are carefully layered and beautifully made with such detail that they look priceless. The Happy September Birthday is perfect for one of my best friends birthday, it’s super adorable with the little seeds. Your Awesome to the Core is super adorable to let someone know you are thinking of them. And the Wishing you a sweet and fruitful year is great for any teacher! Also comes with some colourful stamps!